It is what it is, a key chain / monkey fist. It fits great in your pocket, very well made and so on. For the money, a decent value and alone is an effective defensive tool if used properly. The ball is small however, about the size of a gum all, so singularly the weight leaves it lacking for self defense. Used in unison with another, however, and you have a very effective self defense tool that can be used when escape isn't an option. This was my reason for the "average" rating. If you want a conversation piece key chain, then this is a great value. If you are considering this as a defensive tool, then buy two or more and learn how to use them. I like my monkey fist, it`s stealth build is just right for a pocket etc. In a swing or punch, it would be quite helpful. It is great as a tool like we used in the Navy and has gotten the attention of someone which had never seen one before. He thought it was a nice piece.I like it. The monkey fist is well made but I think its too small for any kind of self defense. The ball bearing at the end is roughly the size of a gumball or jawbreaker so imagine swinging that on a 6 inch piece of rope and that's what you have with this product. I think using your fists would be more effective at defense than swinging this small thing around..but don't get me wrong..this would be effective enough to annoy someone so they would leave you alone. 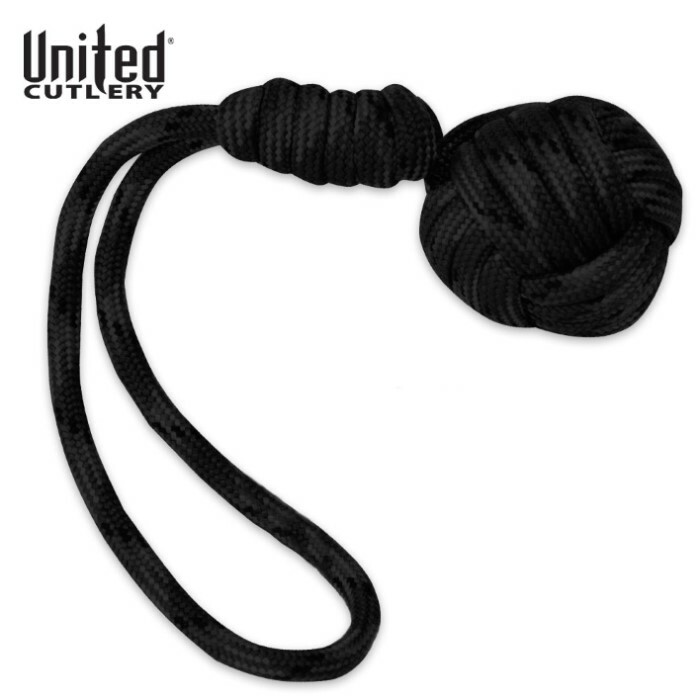 It is smaller than what I expected to be, the ball(including the paracord wrapping) size is comparable to a "whopper malt ball candy" the other end of the device have a "hangman noose" which allows the device to be extended and wielded as a flailing weapon. Pretty compact and versatile though, it is another example of an improvised weapon. Be sure to attach a key ring or a small object at the noose end though otherwise it will slide the cord all the way through (disolving the noose). It is also another example of human ingenuity and another use that paracord can have. I love mine. Its well made, small, easy to conceal. I have been practicing with mine daily. A really good deal.